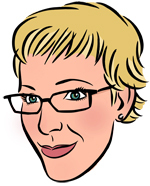 Note from Suzette: Melting Mama keeps a huge blog that centers largely around her experiences with Weight Loss Surgery. She has graciously given me permission to surf around her blog to find something fantastically interesting to cut and paste here. The problem was picking just one thing! But the entry below, dated 4/13/07, particularly touched me, because it speaks to social and familial issues that are effected by weight and surgery. If you visit Beth's blog, you'll get to see real pictures and read so much more. I recommend it highly. Here's the entry I chose. It's that time again. Time to journal food and watch what's going in. I've avoided my scale since that day it freaked out on me. Getting on the scale at the doctor's office made me cringe. I flung the slider over to 164-165 and it nearly balanced, and the nurse was like, "Wow, you're good." I just said, "Ugh." I felt better, though, when I saw her flip through my chart looking for old test results. She opened the folder up to a page from 2002, and my weight was listed. 293 lbs. Someday - I'd like a full copy of my history - to do a chart of my weight, from birth to now. Really. I'd like to see the fluctuations, and the curve of childhood onward on the growth charts. I'm more interested now, too, because my children are all technically "overweight" or "obese." I hate writing that - but it's the honest truth. My two oldest have a physical next week - and again, I am dreading it. Why? Because the doctor is (has to be, I'm sure) negative about weight issues, and my kids are hyper-aware of size and size differences. Telling them that they need to "eat healthy" is ridiculous, considering our family situation. Telling a nine going on ten year old girl that she's overweight and needs to eat healthy is just asking for a future bulimic. She's completely aware that she's a big girl - and it's awful because kids at school talk about "how much they weigh." She was at my appointment last night, and looked at the scale when I got off. She saw my weight, with all my clothes and stuff on - was 164 lbs. She did the math, subtracting hers from mine. She told me last night that someone in her class weighs 50 pounds. I asked her how she'd know this, and she says that they talk about weight. She then tells me that one of her best friends is 90 lbs. She realizes that there are huge differences in kids of the same age range - and that she's out of both spectrums. I explain that people are built differently, and everyone in our family is built big and strong (like trucks?!) and that even our five year old is bigger than 50 lbs, and our baby is also big, so she's not alone. Truthfully, none of our immediate relations are thin. They're all either a few pounds overweight, obese or morbidly obese, and super morbidly obese. But, now her mom and dad are nearly normal sizes... it's got to be weird. The only real positive about he and I being smaller now with bigger kids?